For about five years in the late 1990s and early 2000s, I worked in computer system support. One of my chief responsibilities during that time was to keep three different rooms full of computers running. Most of these computers were mid-1990s Macintoshes, so the rooms were full of lots of beige boxes. There were a wide variety of models, however, and many of them had their own quirks. The main challenge was to just keep everything running so that there were as many available computers as possible. That required a lot of careful attention and understanding of the various quirks of the systems. One thing I couldn’t help but notice, though, is that there seemed to be a lot of hardware problems in the labs. Computers failed constantly. I originally wrote it off to them being old, but I couldn’t help but notice that when I would take the case off of a broken computer, it was almost always filled with dust. Lots of dust. I would have to spend some time cleaning off the dust before I could diagnose the problem. “Mysteriously,” the computers would begin working again half the time when I cleared out all of the dust. Eventually, I concluded that the dust might be causing the problems, so I set aside a weekend when no one else was around, opened every case in all of the computer rooms, and cleaned out all of the dust. After twenty or so hours of work (and a lot of sneezing), the rooms were open on Monday like normal. Guess what? Our hardware failures fell by 90% over the next year. Dust is the mortal enemy of electronic devices. Let enough dust build up in there and it’s likely that your device is going to eventually run into problems. Dust will cause circuit boards to fail and will get into the tiniest grooves in electronic devices. Electronic devices tend to attract this dust due to the electric fields that they generate, pulling the dust into their innards. Even in a rather non-dusty environment, devices can become loaded with dust. The best solution is to clean up your electronic devices on a regular basis. It’s as simple as opening the case, spraying the insides with some compressed air until the dust is gone, then closing up the case again. You can do this to many of electronic devices in your home, such as your DVD player and your computer. Make sure the item is unplugged and powered down before opening the case. Unscrew any and all visible screws and remember where they went. 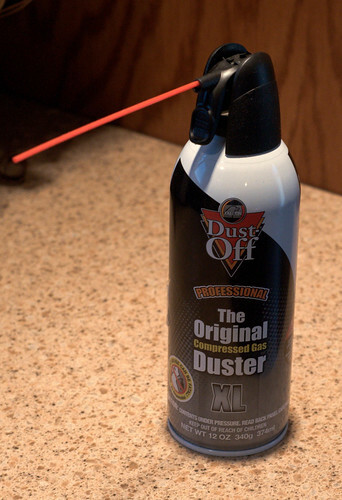 Remove the case, pull out any large “dust bunnies,” then spray the inside of the case with compressed air to remove remaining dust. Put the case back on, then plug the device back in. That’s all you have to do. What do you get out of this? Your electronic devices will have a longer lifespan. They’ll also use a bit less electricity, too, as their cooling fans won’t have to run nearly as much. In other words, cleaning out your electronic devices saves you money now (on lower energy bills) and money later (on lower replacement costs). That’s something well worth doing.